Every year, thousands of locals and tourists alike pile into the town of Bunol, Valencia, ready to throw tomatoes in the faces of complete strangers. Sounds crazy right! That’s exactly what it is. Each year up to 145,000kg of tomatoes get thrown by about 50,000 people from all over the world, and until you hear the second gunshot, it’s every man for himself. By the end of the fight, everything and everyone is covered in juicy red goodness. You will have tomato in places you didn’t think you’d ever have tomato, but that’s half the fun! The festival itself starts around 11am but the party starts much earlier in the morning to get everyone in the mood. Wake up, have a drink, get changed, have another drink. Eat some breakfast, keep drinking… Basically it’s an all day party from the second you open your eyes. Once you’re in the festival, you’re in there for a while, so prepare for battle. There are rules that say the tomatoes have to be crushed before you throw them so they don’t hurt people in the process but this doesn’t always happen. Prepare for a few tomato related injuries, or drink enough sangria to numb any pain you might feel. At the end of the festival, everyone gets a hose down before they head to the pool to clean themselves up a little more. The whole thing from start to finish is ridiculous fun and you want to be involved in it all. The official afterparty is also a whole heap of fun. Every tour company, man and his dog are there and it’s the perfect opportunity to go and talk to the cutie you were eying off in the tomato fight. Wear closed toe shoes unless you want your feet to be destroyed. 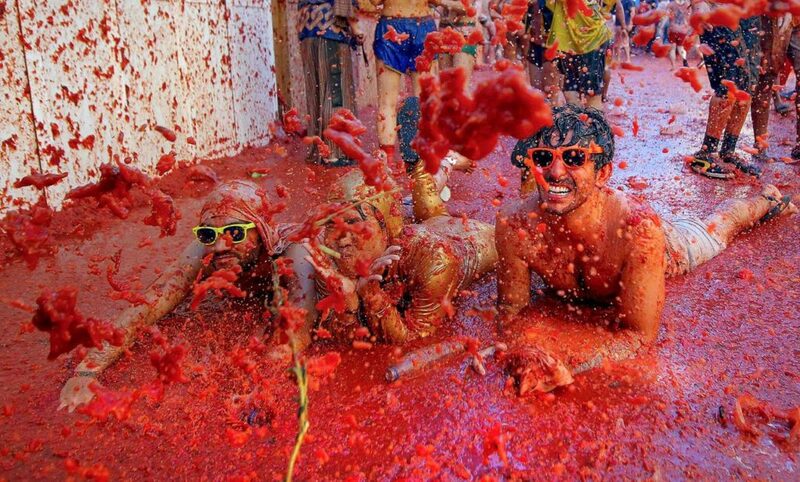 Wear white, sounds silly to wear white to a tomato fight, we know, but it’s tradition and you can’t argue with that. Only take in things that you need/won’t be devastated if you lose. Don’t rip anyone’s clothes off, we know you might be tempted, but the security guards won’t be having a bar of it. Bring a change of clothes because you won’t be allowed back on the bus covered in tomatoes. Put your cash in a snap lock bag and put it in your pocket to make sure it doesn’t get damaged or stolen. Get a waterproof case/bag for your phone if you don’t want it to have tomato in every hole. How do you get there? Obviously the best and easiest way is to book a spot with Stoke Travel and get the most out of the party. We offer all inclusive camping, hot meals, a bloody mary on the morning of the fight, entrance to the after party and free booze at the campsite exclusively for Expat Republic readers if you use the promo code “YOLO” when booking. Our campsite is also home to the biggest party outside the fight itself, with live music from international bands and hundreds of the craziest and most fun guests from all over the world, ready to get down and dirty. Don’t forget to use the exclusive promo code EXPAT for unlimited beer and sangria during your stay, or for the hotel option use EXPAT for a wine and water upon arrival.